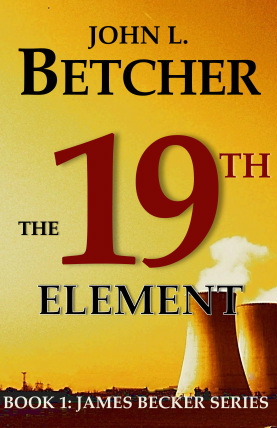 Download sample chapters from THE 19TH ELEMENT in PDF format here. MORE THAN 175,000 COPIES SOLD. AMAZON TOP 100 BESTSELLER. B&N TOP 100 BESTSELLER. TOP TEN BESTSELLER IN SUSPENSE AND THRILLER CATEGORIES. "Betcher writes with intelligence and humor. The 19th Element is an intriguing blend of Robert Parker wit and Vince Flynn action. A fun, exciting read for anyone who enjoys a well-written thriller." -Lois Greiman, award-winning author of the Chrissy McMullen mysteries. GOLD MEDAL THRILLER – 2011 Readers Favorite Book Awards. "Best Self-Published Book of 2010" Dollycas's Blogspot. Lori Caswell - Amazon Top Reviewer and Book Blogger. Terrorists plan to attack Minnesota's Prairie River Nuclear Power Plant, but they’re not your typical band of Islamic extremists. True, there’s an al Qaeda connection. But the heart of the "terror cell" is homegrown, right here in the United States. James "Beck" Becker is a former elite U.S. government intelligence operative who has retired to his childhood hometown of Red Wing, Minnesota – just six miles down the Mississippi from the Prairie River Nuclear Power Station. He recognizes connections between seemingly unrelated incidents – a murdered agronomy professor, a missing lab assistant, an international cell call, a stolen fertilizer truck, an explosion in the street in front of City Hall – but can't piece it together in enough detail to convince government authorities that a larger threat exists. Only his American Indian friend, "Bull," will help Beck defuse the threat. So it's Beck and Bull versus the best terror cell west of the Mississippi.